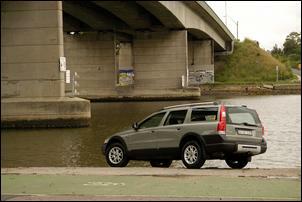 At AUD$64,450 (in five-seater guise) we thought the Volvo XC70 was a pretty decent buy. But here we are a few months later testing essentially the same vehicle - except with a RRP of AUD$56,960 (a saving of AUD$7490)! At this price, the newly released XC70 SE should really catch the eye of Subaru Outback and Holden Adventra buyers. 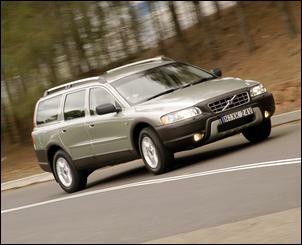 The XC70 SE uses an identical driveline to the more expensive LE version. You get the same wonderfully punchy 2.5-litre five-cylinder turbo engine (which puts out 154kW at 5000 rpm and an impressive 320Nm between 1500 and 4500 rpm) and a five-speed sequential shift automatic transmission. It’s a brilliant combination that lets you use the massive torque of the turbo engine without down-changing for gradual inclines. You can also sprint away from a standing start with real urgency (Volvo claims 0 – 100km/h in 8 seconds flat). The XC70 engine is everything a modern turbo engine should be – the only criticism is a slightly growly note and so-so fuel consumption. 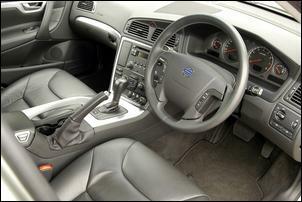 The lack of steering wheel mounted gearchange buttons is also surprising. 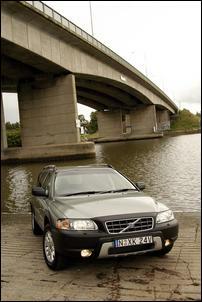 In a mixture of heavy traffic and motorway driving, the XC70 returned 12.6 litres per 100km fuel consumption. Not bad given the spritely performance and 1655kg kerb weight but, interestingly, a ‘big’ 4-litre Ford Falcon gives slightly better consumption in identical conditions. Oh, and the Volvo comes with a recommendation for 95+ RON fuel. The XC70 gets its torque to the ground via an electro-mechanical Haldex AWD system. The Haldex centre coupling channels 95 percent of torque to the front wheels at cruise and increases the rear-drive torque split when slip is detected. On hard launches, the system allows some front tyres scrabble before torque is sent to the rear wheels; torque split is seamless. With its electronically-controlled AWD system teamed with front strut and rear multi-link suspension, the XC70 is sure-footed and gives mild understeer when pushed. Dynamic Stability and Traction Control (DTSC) is available as an option to further improve driver control. The ride is comfortable and there’s plenty of suspension travel for the majority of conditions. Unlike many larger SUVs, the XC70 has only a slight feeling of having high unsprung mass. Wheels are 16 inch alloys wearing 215/65 Pirelli Scorpion STP tyres. The Volvo’s power-assisted rack and pinion steering is light but our test car had some kickback when tackling rough corners under power. The brakes are also light to operate and come augmented with ABS and EBD control. Electronic Brake Assist (EBA) is optional. So far the XC70 SE manages to run lineball with the more expensive LE version – but not when you look inside. The SE model does without electric adjustable and heated front seats, an interior air quality system, electric glass sunroof and comes with standard aluminium highlights instead of timber. 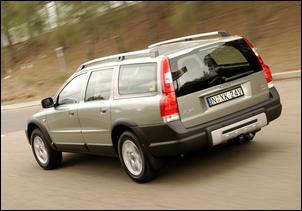 But, despite being stripped of some good bits, the XC70 SE never feels under-equipped. Standout features include rear park assist, an auto dipping rear view mirror, a trick multi-function centre armrest (with a folding drink holder than can be flipped for use by rear passengers), six airbags, an easy to use trip computer, and dual-zone climate control. The eight speaker sound system is also brilliant. The standard leather seats are very comfortable but the XC70 doesn’t offer abundant occupant space. Headroom is generous in all seating positions but the transmission tunnel and centre console eat into front space while rear passengers will complain of the limited foot space. If you’re the sort of person who will take the XC70 on regular long trips you’ll appreciate its vast cargo area. 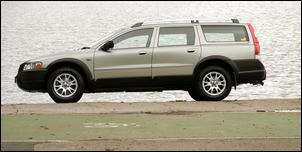 The XC70 has a long and wide load space together with a low loading lip and a relatively high-lift hatch. With the rear backrests upright, there’s 485-litres of cargo volume but it’s easy to tumble the rear lower cushion and fold the backrest perfectly flat. Then you have an enormous 1641-litre cargo volume at your disposal. 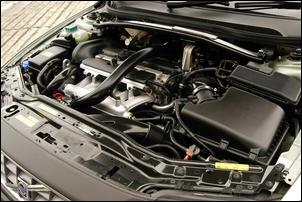 A cargo blind, tie-downs, a 12V power socket (one of three throughout the cabin) and an under-floor storage stray can also be found in the cargo area. The XC70 doesn’t pretend to be a serious bush-bashing machine but it can certainly cope off the bitumen thanks to its impressive suspension travel, front and rear bumper skid plates, and considerable 209mm ground clearance (which is more than a Holden Adventra). The biggest limitations are the lack of a centre diff lock, low-range gearing and the provision of only a space saver spare wheel. The body looks tough with its wide track, elevated stance, wheel arch extensions, lower sill trims and aluminium roof rails. We love the large exterior mirrors (which cleverly combine a flat and curved mirror element for a wider field of vision) but, unfortunately, you miss out on the bi-xenon headlights and headlight washer system which come standard in the LE model. Our test car showed exceptional build quality and a feeling of solidity thanks to its thick doors (which shut beautifully), beefy sill panels and pillars. There are no big changes over the XC70 LE version but the bargain priced SE certainly has great appeal. With its AUD$7490 saving, the base-spec XC70 stacks up very well against the other station-wagon type AWDs on the market. It’s w-a-y cheaper than the Audi Allroad while being only a few grand dearer than the top-line Subaru Outback and Holden Adventra. But, really, we reckon the XC70 SE should appeal to a very wide buyer market – in many instances it’s what people should be driving instead of larger SUVs. It doesn’t matter which end of the AWD segment you’re looking at – take a Volvo XC70 SE for a drive and you’ll be impressed.